Hello there! Jukia here with a new creation. I have created a couple of “empty” bookcases that you can take and personalize. These bookcases have nothing on the shelves. Within the Rar is a bmp of what is origionally on the bookshelves. 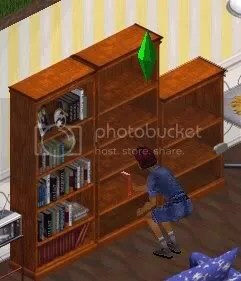 Feel free to modify and recolor these bookcases to your hearts content. If you do use them please give me some credit. I have also created a half-bookcase for download. To find it click here. Enjoy these new objects, and have fun personalizing. If you would like further instruction on how to modify and recolor objects let me know, I plan to create a tutorial to help you out (please ask me and I will make it).